Arrayit AHC4X24 Hybridization Cassettes enable up to 96 hybridization or protein microarray reactions in a 3 x 8 x 4 format. 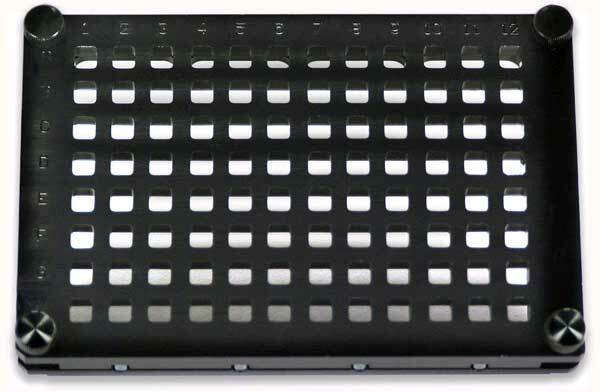 AHC4X24 holds 4 standard glass substrate slides (1 x 25 x 76 mm) and uses a silicone gasket to create 96 individual reaction areas for up to 96 simultaneous microarray reactions. This hybridization cassette utilizes a compression-fit silicone gasket to demarcate the microarray reaction areas, eliminating the need for contaminating adhesives and inks. The 7.5 mm x 6.5 mm reaction areas are configured at 9 mm center-to-center spacing in the 3 x 8 x 4 format for compatibility with all multi-channel pipettes and automated liquid handling robots and workstations. AHC4X24 is precision-machined from durable, flat high-grade aluminum to ensure proper alignment and leak-proof fit. The top portion of the cassette is engraved with a 1-12 number panel across the top and an A-H letter panel down the left side for unambiguous identification of each of the 96 reaction wells. Each AHC4X24 includes a anodize aluminum top and bottom, and a 3 x 8 x 4 well silicone gasket. Hybridization cassette, 4 substrate slides, 32 microarrays (1 x 8 x 4), large wells.